After years of moderating Facebook groups, I've discovered nine keys for success. This year at ISTE, I along with my New York City colleagues, JoJo Farrell (@FarrellJoJo ) and Jackie Patanio (@JPatanio ) shared how as school district administrators we have worked together to form a supportive community that encourages educators around New York City and helps them get instant answers, feedback, advice, and kudos, from colleagues around the clock. If you’re thinking about creating an online community for the educators where you work, our keys to success may be helpful for your community too. Go where your audience is (for us Facebook). Secure solid moderators that don’t dominate, but rather facilitate in the background. Jargon (PLNs, Connected Educators) can be scary. Just invite folks to join your group. Be consistent: Group name, social media hashtag, conference name. Vendors can be your friend if you set the tone. Remember the importance of scheduling face-to-face meetings (meetups, conferences) too. Ask screening questions to get the right members in the group. So what do you think? Are these some keys you think can work successfully in a group in which you moderate or participate? Anything missing? Anything about which you want to know more? You can see our presentation below. The new International Society for Tech in Education Standards are a hit among innovative educators, but how do you bring them to your classroom, school, or district? That was the topic of the discussion I proposed and participated in at the #HackEd17 unconference at #ISTE17. The group was comprised of teachers, district administrators, and college professors. Below are the ideas we discussed that would help lead to a successful implementation. Here is a video featured on the ISTE Site from Flocabulary, that provides a fun and insightful overview of the student standards. It’s a great way to get started. Steering Committee: Form a steering committee to support this work. Include key stakeholders such as tech teachers, librarians, administration, students, parents. Assess What’s Already Happening: Look at the standards and determine what is already happening in alignment with the standards and identify where this is happening. Live local examples will resonate and bring the standards to life. Recognize Teachers: Have professional development to get teachers going, but also opportunities for teachers to have a higher level of recognition as those who are effectively incorporating standards into their work. Use ISTE Student Standards for Assessment: Tech teachers sometimes struggle with finding meaningful way to assess students. The ISTE student standards provide a great way to look at each standard and indicate how students are meeting them. Dr. Leigh Zeitz introduced the idea of an artifacts matrix (which he describes on his digital portfolio site) and I created a sample artifacts matrix you can copy and use. Here are some interesting insights to consider. One artifact is likely to meet several standards. What? So What? No What? So, what do you think? Are these standards that you have or plan to implement where you work? What are some keys to success, concerns, or challenges you have experienced or are considering where you work? Want to learn more? Connect with other educators in the ISTE Standards Community and learn how to use the standards in the classroom with the ISTE Standards for Students ebook. Innovative educators are becoming more and more aware of the need to produce content and materials for users of all abilities. That means when publishing digitally, it is important to ensure what you are publishing is accessible. This means considering how you use text, images, and colors as outlined in this article about accessibility. It also means creating accessible links. The most commonly known way to start doing that is to avoid creating links that tell the reader to "click here" for more information. Three reasons you don't want to say "click here"
Here are a four strategies you can keep in mind to make your links more accessible. Do your best to explain where the link is taking the reader. If you are interested in working productively, then read this article on the most important elements of high functioning teams. If you are interested in working productively, then click here to read about high functioning teams. Make links recognizable both by using another color and underlining them. Do not underline text that is not a link. It is hard for someone using a screen reader to understand urls because they are read as individual letters, not words, so don't use them. If you want to stay current with the future of education read The Innovative Educator blog. If you want to stay current with the future of education read https://theinnovativeeducator.blogspot.com. What do you think? Are these strategies you generally put into effect? Were some of them new to you? Any surprises? Here’s a fun idea for innovative educators who do workshops or presentations. When you want participants to share after they have turned and talked, use this random participant generator that also helps those in attendance learn fun facts about one another. Who has worked in the field the longest? The shortest? Where did you grow up? Go to college? In addition to being a fun method to get the conversation going, another benefit of this method is that everyone knows they may be selected. As a result there is added motivation to stay on task during discussions and share something that will benefit the group. Check it out and if you like it integrate these slides into your next presentation. Haven’t been keeping up with The Innovative Educator? Don’t worry. That’s what this wrap up is for. Here’s what’s hot: Effective Meetings! I had the opportunity to attend a full day workshop on effective meetings and I took what I learned and made it into articles for readers of The Innovative Educator. Check out this week’s hottest posts and learn how to make meetings more effective, how to sabotage meetings with tips from a declassified CIA manual, and a post that gives a 4-step model to have productive meetings based on personality type. So what are you waiting for? Now's your chance. Take a look at the posts below and click the link to read one(s) that looks of interest to you. If you like any of these posts, I hope you’ll share with others on Twitter, Facebook, email or whichever platform you like best. Bias. Privilege. Racism. These were the topics tackled at a workshop at #EdXEdNYC, an annual education conference held at Hudson High School in Manhattan. If you’re an educator, you understand it is your moral responsibility to address these issues for yourself and with your students, yet few of us have received meaningful preparation for this. These are uncomfortable topics that are necessary to address in uncomfortable times. During the 90-minute workshop it became clear that to move in the right direction we need to keep talking, build relationships, and act respectfully to one another. We have to do much more to ensure our underprivileged youth reach their potential and are given the support to have an opportunity to influence their world and be included in conversations, and work, that matters. Many of these youth don't have others in their communities who serve as role models of what they can achieve and/or don’t have proper guidance on how to get there. A man who attended the session which was called Mindfulness to Address Bias In Education told the story of a smart young student in his class who shared post-high school plans were to get a job at GameStop. After a year with this youth, the teacher helped inspire him to pursue a track that involved applying to colleges to study computer science. No one else was telling this impoverished inner city youth that this was possible based on his talents, interest and abilities. There’s not enough guidance counselors to do that. There are few to none when it comes to college graduates in the projects in which he lives to help lead the way. This has to change. Organizations like PowHERful were created to just that. The organization was started by Soledad O’Brien. As she was covering the devastation caused by Hurricane Katrina, she encountered young people whose lives had been turned upside down as they saw their homes and school system literally washed away. These students had an urgent need for specific financial assistance and Soledad was inspired to begin work that could help. She formed the Starfish foundation (now PowHERful) which quickly recognized that these young people needed them to do more than cut a check. They needed a team who could give these young women opportunities that would not otherwise be possible because of devastation and/or family circumstances. Countless starfish have washed ashore on a beach and are dying off. A little boy is picking them up and tossing them back into the ocean in the hope they’ll survive. A man walks by and asks him why he’s doing something so futile. PowHERful takes each starfish youth under its wing, providing them with financial support, mentoring and wrap around services that bring them to and through college. As a result these young ladies are given the opportunity to achieve the success they are capable of, but to which they may not otherwise have access. This resonates with supporters like Orange is the New Black’s Diane Guerrero who I spoke with at a fundraiser Gala to celebrate PowHERful’s young women scholars. She attended an AIDs Healthcare and Awareness event in Cleveland hosted by Soledad O’Brien. They got to talking about how there’s post-election drama. They discussed why in times when we have a country working against communities of color, it is so important to do work that empowers them and helps to give them the voice they deserve. Focusing on and giving opportunities and a voice to women of color is where the foundation is now focused and the results are impressive. I had an opportunity to speak to some of the scholar graduates to hear their experiences. Ariana Quinoes is a 2016 graduate of Smith College who now serves at Program Coordinator of the BOLD Women's Leadership Network at Rutgers University. She met the two women who created the program she works for today through PowHERful. Her education and experiences prepared her well for the field of women’s empowerment and activism. While at Smith, Ariana was a member of the student group Organizing for Undocumented Students’ Rights which works towards making Smith a reality for undocumented students. Both advocating for those who deserve a chance and her English degree have put her on a path to make the difference she wants. In the future she wants to further this type of work. She plans to pursue a law degree with an emphasis on immigrant rights. I spoke with Lakiesha Jernagin who has been a PowHERful mentor for five years. She explained what a joy it is to watch the mentees go from babies to ladies as they move to and through college. She met Tyshell King during her senior year of high school. Now five years later she emerges a Georgetown University graduate who plans to pursue her masters at UNC Greensboro where she will study business with an emphasis on fashion. Soledad shared with me the joy she feels in giving these young ladies such a gift. She explained that she was raised by immigrant parents. Her mother, who is Cuban, was an educator who instilled the importance of education into the family. Her mother explained that once you receive an education no one can take that away from you. Soledad had met so many young women whose life plans had been stagnated by terrible disasters, compounded by generational poverty. Soledad’s organization takes each young lady and launches them into a brighter future. PowHERful is launching their starfish scholars into bright futures, but it takes more than just one organization to transform a community, city, state, or nation. If our society really wants to help lift it citizens out of lives of poverty and/or devastation, the answer isn’t simply to send them to public school and hope for the best. It isn’t a system where there is one guidance counselor for hundreds who can’t possibly give students the support they need. It is to do what PowHERful is doing, and come up with a team for every student that is made up of others who know how to bring young people to success. Who can help them when they’re struggling and down not only with encouragement and motivation, but financial support for extra tutoring and interventions. It means having people who can convince a family, that GameStop should not be the last stop on their child’s journey. It means helping families develop a college tradition so they can give their own children the gift of an education and not just a high school diploma. The same type of education our society needs to enter into professions like doctors, lawyers, and elected officials. PowHERful has helped about two dozen young scholars. How can other individuals and organizations step up to help other promising youth achieve their dreams? 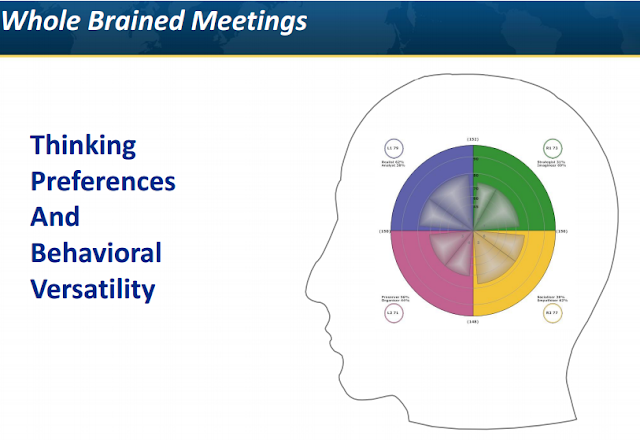 To run effective meetings it is helpful to have insights into the personality types of your colleagues using a tool like, DISC, which you can access for free here, Myers Briggs which you can access for free here, and Neethling Brain Instrument (NBI). This was the tool of choice at a recent workshop I attended led by Coaching Psychologist Yaron Prywes (@Yaron321) who specializes in innovation. He selected this tool, because unlike some of the others with many types this one has four basic personality types to focus on connected to left brain and right brain thinking. The test costs about $30 per person, but if that’s not in your budget, you can look at an overview of personality types from a resource such as this article from Success Reboot. If you want to quickly get a sense of the personality types of the people on your team, let them read the descriptions of each and have them determine those with which they most identify. The most high performing teams have a distribution of types, but it is important to note that most people have strengths in more than one quadrant, so even if one of the types is not their “most” dominant they may be able to pull from a quadrant that is close to it. For example, I took the test and was R1 dominant (score of 82) with L2 (score of 76) as my next highest. So, I am someone who might be good at tasks in either of those quadrants. Once you know the personalities in the meeting, you have the elements necessary for conducting what Yaron described as a whole-brained meeting. That allows you to move to this four-step meeting model where all brain types are recognized for their strengths and each member has a purpose. L1: What does success look like? R1: How we are going to solve a problem? R2: Who needs to be there? L2: What is the plan and what is the timeline? 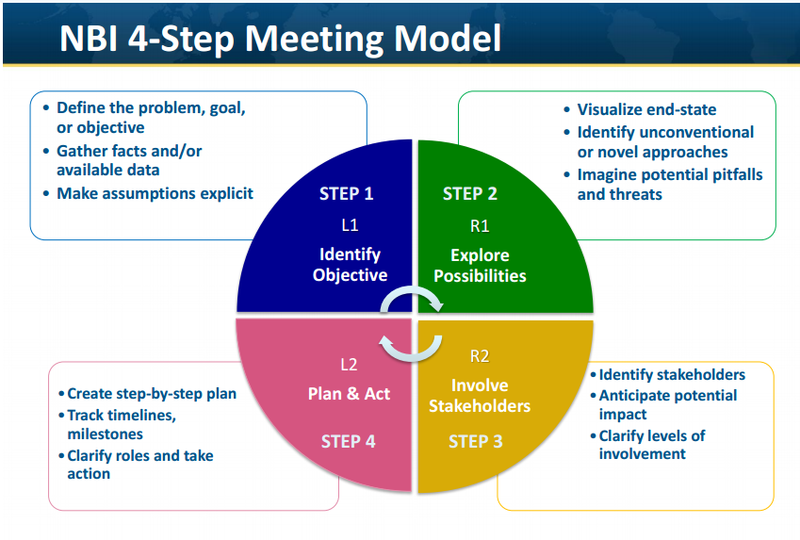 Next time you have a meeting, try putting this four-step model into place and see if it increases the effectiveness and productivity in your meetings. Making its way to the top for the first time is a post about an innovative alternative to interactive whiteboards from Google. Read this article to learn more about the Jam Board. Next up is a post that looks at a strategy that Google uses with its staff: Rewarding thoughtful failure. This post shows how a New York City educator who was featured in the NY Times successfully brings this concept to life in her classroom. Rounding out the top is a post that looks at the one element that has the most impact on ensuring you have a high-performing team. Wonder what that is? Read this article and find out.